1) Soak green gram for 8- 10 hours. Drain and tie it in a muslin cloth / cheese cloth overnight or over 12 hours to get fine loong Moong sprouts. 2) Pressure cook this with minimum salt and water for 3 whistles. Drain the water. 3) In a pan, prepare tempering with all the ingredients. Add the cooked moong dal. Stir lightly. Adjust salt and seasonings. Add grated coconut, coriander and lemon juice. Healthy sundal..A bowl of sundal with a cup of curd will be a filling meal for me. super ...like the healthy dish. Nutritious n protein packed sundal,i can finish that bowl anytime..
@ valli - u r right to an extent : Curry is more a legacy by the British RAj in India (like the way they anglicised so many of our disehs). But the authentic tam brahms actually call any dry dish as "karamudhu" (tamil) or max poriyal . Curry is more used colloquially ! Healthy yummy sundal looks delicious! I would call it salad or a sauteed green gram sprouts. Would love to eat it just plain as a snack also. one healthy and tasty dish!...love to eat it just like that! 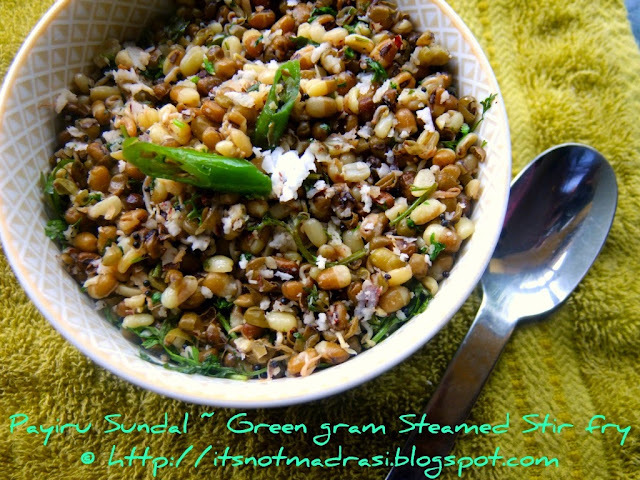 Nice sundal..A useful recipe during this festival time..
Fav kind of evening snack!! Healthy & nutritious Sundal. Lovely clicks. I make this too .. looks good Kalyani. Healthy. 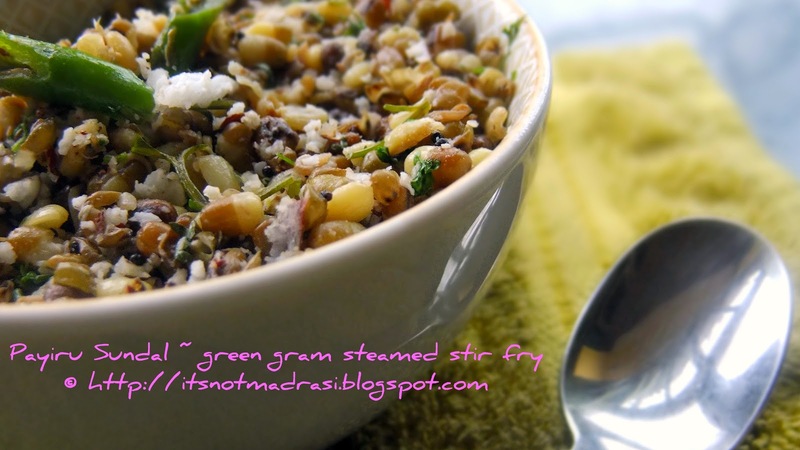 My favourite sundal and usually I make during Navratri!! Salad is an apt title to Sundal! Lovely and healthy sundal, Kalyani!